The Trump tax plan has some very good elements and several that I dislike strongly. For reference, this link includes the contents of an “interpretation” of the proposal from Goldman Sachs, based on the one-page summary presented by the Administration last week as well as insights that the investment bank might have gleaned from its connections within the administration. At the link, click on the chart for an excellent summary of the plan relative to current law and other proposals. “In recent days I have … heard and read several media reports on Trump’s tax plan…. Nearly all of these reports are juvenile: changes in tax rates are evaluated by the media according to changes in the legal tax liabilities of various groups of people. For example, Trump’s proposal to cut the top federal personal income-tax rate from 39.6% to 35% is assessed only by its effect on high-income earners. Specifically, of course, it’s portrayed as a ‘gift’ to high-income earners. “… higher-income taxpayers paid more — repeat, MORE tax revenues into the federal treasury under the lower tax rates than they had under the previous higher tax rates. … That happened not only during the Reagan administration, but also during the Coolidge administration and the Kennedy administration before Reagan, and under the G.W. Bush administration after Reagan. All these administrations cut tax rates and received higher tax revenues than before. In some cases, a proportion of the increased revenue may have been due to short-term incentives for asset sales in the wake of tax rate reductions. In general, however, Sowell’s point stands. The first sentence of that quote highlights the obvious storyline pounced upon by simple-minded journalists, and it also emphasizes the failing political appeal of tax cuts when a decreasing share of the population actually pays taxes. After all, there is some participatory value in spreading the tax burden in a democracy. I believe Williamson is well aware of the second-order, dynamic consequences of tax cuts that spread benefits more broadly, but he is also troubled by the fact that significant spending cuts are not on the immediate agenda: the real resource cost of government will continue unabated. We cannot count on that from Trump, and that should not be a big surprise. Greater accumulation of debt is a certainty without meaningful future reductions in the growth rate of spending. Lower tax rate on corporate income (less double-taxation): The U.S. has the highest corporate tax rates in the developed world, and the corporate income tax represents double-taxation of income: it is taxed at the corporate level and again at the individual level, perhaps not all at once, but when it is actually received by owners. Adoption of a territorial tax system on corporate income: The U.S. has a punishing system of taxing corporate income wherever it is earned, unlike most of our trading parters. It’s high time we shifted to taxing only the corporate income that is earned in the U.S., which should discourage the practice of tax inversion, whereby firms transfer their legal domicile overseas. No Border Adjustment Tax (BAT): What a relief! This was essentially the application of taxes on imports but tax-free exports. Whatever populist/nationalist appeal this might have had would have quickly evaporated with higher import prices and the crushing blow to import-dependent businesses. Let’s hope it doesn’t come back in congressional negotiations. Lower individual tax rates: I like it. Fewer tax brackets: Simplification, and somewhat lower compliance costs. Fewer deductions from personal income, a broader tax base, and lower compliance costs. Scrapping deductions for state and local taxes in exchange for lower rates will end federal tax subsidies from low-tax to high-tax states. Elimination of the Alternative Minimum Tax: This tax can be rather punitive and it is a nasty compliance cost-causer. The corporate tax rate should be zero (with no double taxation). Taxation of cash held abroad, an effort to encourage repatriation of the cash for reinvestment in the U.S. Taxes on capital of any kind are an act of repeated taxation, as the income used to accumulate capital is taxed to begin with. And such taxes are destructive of capital, which represents a fundamental engine for productivity and economic growth. Retains the mortgage interest and charitable deductions: Both are based on special interest politics. The former leads to an overallocation of resources to owner-occupied housing. Certainly the latter has redeeming virtues, but it subsidizes activities conferring unique benefits to large donors. Increase in the standard deduction: This means fewer “interested” taxpayers. See the discussion of the Kevin Williamson article above. We should have just one personal income tax bracket, not three: A flat tax would be simpler and would reduce distortions to productive incentives. Tax relief for child-care costs: More special interest politics. Subsidizing market income relative to home activity, hired child care relative to parental care, and fertility is not an appropriate role for government. To the extent that public aid payments are made, they should not be contingent on how the money is spent. Many details are missing: Almost anything could happen with this tax “plan” when the real negotiations begin, but that’s politics, I suppose. Descriptions of the changes to treatment of pass-through” income seem confused. There is only one kind of tax applied to the income of pass-through entities like S-corporations, and it is the owner’s individual tax rate. Income from C-corporations, on the other hand, is taxed twice: once at a 15% corporate tax rate under the Trump plan, and a second time when it is paid to investors at an individual tax rate, which now range from 15% to almost 24% for “qualified dividends” (most dividend payments), but are likely to range up to 35% for “ordinary” dividends under the plan. So effectively, double-taxed C-corporate income would be taxed at total rates ranging from 30% to 50% after tallying both the C-corp tax and the individual tax. (This is a simplification: C-corp income paid as dividends would be taxed to the corporation and then immediately to the shareholder at their individual rate, while retained corporate income would be taxed later). Presumably, the Trump tax plan is to reduce the rate on “pass-through” income to just 15% at the individual level, regardless of other income. (It is not clear how that would effect brackets or the rate of taxation on other components of individual income.) Is that good? Yes, to the extent that lower tax rates allow individuals to keep more of their hard-earned income, and to the extent that such a change would help small businesses. S-corps have always had an advantage in avoiding double taxation, however, and this would not end the differential taxation of S and C income, which is distortionary. It might incent business owners to shift income away from salary payments to profit, however, which would increase the negative impact on tax revenue. Interest deductibility and expensing of capital expenditures are in question. Interest deductibility puts debt funding on an equal footing with equity funding only if the double tax on C-corp income is fully repealed. Immediate expensing of “capex” would certainly provide an investment incentive (as long as “excess” expenses can be carried forward), and for C-corporations, it would certainly bring us closer to elimination of the double-tax on income (the accounting matching principle be damned!). There is no commitment to shrink government, but that’s partly (only partly) a function of having abandoned revenue neutrality. It’s also something that has been promised for the next budget year. The tax reform proposal represents a departure from insistence on revenue neutrality: On the whole, I find this appealing, not because I like deficits better than taxes, but because there may be margins along which tax policy can be improved if unconstrained by neutrality, assuming that the incremental deficits are less damaging to the economy than the gains. The political landscape may dictate that desirable changes in tax policy can be made more easily in this way. Shikha Dalmia wonders whether a real antidote for “Trumpism” might be embedded within the tax reform proposal. If the reforms are successful in stimulating non-inflationary economic growth, a “big if” on the first count, the popular preoccupations inspired by Trump with immigration policy, the “wall” and protectionism might just fade away. But don’t count on it. On the whole, I think the tax reform proposal has promise, though some of the good parts could vanish before a bill hits Trump’s desk, and some of the bad parts could get worse! The following is no mystery: if you want prosperity, steer clear of policies that inhibit production and physical investment. This too: if you want to lift people out of poverty and dependency, don’t promote policies that discourage hiring and work incentives. Yet those are exactly the implications of policies repeatedly advocated by so-called redistributionists. The ignorance flows, in large part, from a distraction, a mere byproduct of economic life that has no direct relation to economic welfare, but upon which followers of Bernie Sanders are absolutely transfixed: income and wealth inequality. Attempts to manipulate the degree of inequality via steeply progressive taxes, transfers and market intervention is a suckers game of short-termism. It ultimately reduces the value of the economy’s capital stock, chases away productive activity, destroys jobs, and leaves us all poorer. “A segment of America is stuck in widespread single motherhood … terrible early-child experiences, awful education, substance abuse, and criminality. 70% of male black high school dropouts will end up in prison, hence essentially unemployable and poor marriage prospects. Less than half are even looking for legal work. “From 1980 to 2010, income gains (after taxes and government transfers are included) favored the wealthy but were still spread across all income brackets: a 53% increase for the bottom quintile; a 41% increase for the next two; a 49% increase for the 4th; and a 90% increase for the richest fifth. Thus, while income inequality may offend our sense of justice, its actual impact on the middle class may be small. The hubbub over inequality and redistribution is fueled by misconceptions. One is that the rich face low tax burdens, often lower than the middle class, a mistaken notion that Alan D. Viard debunks using 2013 data from a report from the Congressional Budget Office. The CBO report accounts for double taxation of dividends and capital gains at the corporate level and at the personal level (though capital gains are taxed to individuals now, while the anticipated corporate income is taxed later). The CBO study also accounts for employers’ share of payroll taxes (because it reduces labor income) so as to avoid exaggerating the tax system’s progressivity. Before accounting for federal benefits, which offset the tax burden, the middle 20% of income earners paid an average tax rate of less than 15%, while “the 1%” paid more than 29%. However, after correcting for federal benefits, the middle quintile paid a negative average tax rate, while the top 1% still paid almost 29%. That is a steeply graduated impact. Rising income inequality in the U.S. is more a matter of changes in household structure than in the distribution of rewards. This conclusion is based on the fact that income inequality has risen steadily over the past 50 years for households, but there has been no change in inequality across individuals. An increasing number of single-person households, primarily women over the age of 65, accounts for rising inequality at the household level. The greedy corporate CEOs of the “occupier” imagination are really not to blame for this trend, though I won’t defend corporate rent-seeking activities intended to insulate themselves from competition. Measures of income inequality hide another important fact: one’s position in the income distribution is not static. Chelsea German notes that Americans have a high degree of economic mobility. According to a Cornell study, only 6% of individuals in the top 1% in a given year remain there in the following year. German adds that over half of income earners in the U.S. find themselves in the top 10% for at least one year of their working lives. That future wealth can and should be enjoyed across the income spectrum, but punitive taxes destroy productive capital and jobs. More than 88.3% of the working-age poor were either unemployed or underemployed! And here’s the kicker: redistributionists clamor for policies that would place an even higher floor on wage rates, yet the floor already in place has succeeded in compromising the ability of low-skilled workers to find full-time work. “Finally, why is “inequality” so strongly on the political agenda right now? Here I am not referring to academics. … All of economics has been studying various poverty traps for a generation…. [The] answer seems pretty clear. Because [the politicians and pundits] don’t want to talk about Obamacare, Dodd-Frank, bailouts, debt, the stimulus, the rotten cronyism of energy policy, denial of education to poor and minorities, the abject failure of their policies to help poor and middle class people, and especially sclerotic growth. Restarting a centuries-old fight about “inequality” and “tax the rich,” class envy resurrected from a Huey Long speech in the 1930s, is like throwing a puppy into a third grade math class that isn’t going well. You know you will make it to the bell. If you hope for government to solve economic problems, try to maintain some perspective: the state has unique abilities to botch it, and its power to distort and degrade the economy in the process of “helping” is vast. Government spending at all levels copped about 18% of the U.S. economy’s final output in 2014, but the public sector’s impact is far more pervasive than that suggests. Private fixed investment in new structures and equipment accounted for only about 16% of Gross Domestic Product (GDP); the nonresidential portion of fixed investment was less than 13% of GDP. I highlight these two components of GDP because no one doubts the importance of capital investment as a determinant of the economy’s productive capacity. But government is a larger share of spending, it can divert saving away from investment, and it creates a host of other impediments to productivity and efficient resource allocation. The private economy is remarkable in its capacity to satisfy human wants. The market is a manifestation of spontaneous order, lacking the conscious design of any supreme authority. It is able to adjust to dynamic shifts in desires and resource constraints; it provides reliable feedback in the form of changing prices to modulate and guide the responses of participants through all stages of production. Most forms of government activity, however, are not guided by these signals. Instead, the state imposes binding and sometimes immediate constraints on the decisions of market participants. The interference takes a number of forms, including price controls, but they all have the power to damage the performance and outcomes of markets. The productive base at each stage of the market process is a consequence of the interplay of perceived business opportunities and acts of saving or deferred consumption. The available flow of saving depends on its rewards, which are heavily influenced by taxes and government intervention in financial markets. It’s worth noting here that the U.S. has the highest corporate tax rates in the developed world, as well as double taxation of corporate income paid out to owners. In addition, the tax system is used as a tool to manipulate the allocation of resources, drawing them into uses that are politically favored and punishing those in disfavor. The damaging impact is compounded by the fact that changes in taxes are often unknown ex ante. This adds a degree of political risk to any investment decision, thus discouraging capital spending and growth in the economy’s productive base. The government is also a massive and growing regulator of economic activity. Over 100,000 new regulatory restrictions were added to the Code of Federal Regulations between 2008 and 2012. Regulation can have prohibitive compliance costs and may forbid certain efficiencies, often based on flimsy or nonexistent cost/benefit comparisons. It therefore damages the value and returns on embedded capital and discourages new investment. It is usually uneven in its effects across industries and it typically reduces the level of competition in markets because small firms are less capable of surviving the costs it imposes. Innovation is stifled and prices are higher as a result. Poorly-executed and inappropriate stabilization policy is another way in which government distorts decisions at all stages of production. There are many reasons why these policies tend to be ineffective and potentially destructive, especially in the long run. Keynesian economics, based on ideas articulated by John Maynard Keynes, offers prescriptions for government action during times of instability. That means “expansionary” policy when the economy is weak and “contractionary” policy when it is strong. At least that is the intent. This framework relies on the notion that components of aggregate demand determine the economy’s output, prices and employment. The major components of GDP in the National Income and Product Accounts are consumer spending, private investment, government spending, and net foreign spending. In a Keynesian world, these are treated as four distinct parts of aggregate “demand”, and each is governed by particular kinds of assumed behavior. Supply effects are treated with little rigor, if at all, and earlier stages of production are considered only to the extent that their value added is included, and that the finished value of investment (including new inventories) is one of the components of aggregate demand. Final spending on goods and services (GDP) may be convenient because it corresponds to GDP, but that is simply an accounting identity. In fact, GDP represents less than 45% of all transactions. (See the end note below.) In other words, intermediate transactions for raw materials, business-to-business (B2B) exchange of services and goods in a partly fabricated state, and payments for distributional services are not counted, but they exceed GDP. They are also more variable than GDP over the course of the business cycle. Income is generated and value is added at each stage of production, not only in final transactions. To say that “value-added” is counted across all stages is a restatement of the accounting identity. It does not mean that those stages are treated behaviorally. Technology, capital, employees, and complex decision-making are required at each stage to meet demands in competitive markets. Aggregation at the final goods level glosses over all this detail. The focus of the media and government policymakers in a weak economy is usually on “underconsumption”. The claim is often heard that consumer spending represents “over two-thirds of the economy”, but it is only about one-third of total transactions at all levels. It is therefore not as powerful an engine as many analysts assert. Government efforts to stimulate consumption are often thwarted by consumers themselves, who behave in ways that are difficult for models to capture accurately. Government spending to combat weakness is another typical prescription, but such efforts are usually ill-timed and are difficult to reverse as the economy regains strength. The value of most government “output” is not tested in markets and it is not subject to competitive pressure, so as the government absorbs additional resources, the ability of the economy to grow is compromised. Programmatic ratcheting is always a risk when transfer payments are expanded. (Fixed programs that act as “automatic stabilizers”, and that are fiscally neutral over the business cycle, are less objectionable on these grounds, but only to the extent that they are not manipulated by politicians or subject to fraud.) Furthermore, any measure that adds to government deficits creates competition for the savings available for private capital investment. Thus, deficits can reduce the private economy’s productive capacity. Government investment in infrastructure is a common refrain, but infrastructure spending should be tied to actual needs, not to the business cycle. Using public infrastructure spending for stabilization policy creates severe problems of timing. Few projects are ever “shovel-ready”, and rushing into them is a prescription for poor management, cost overruns and low quality. Historically, economic instability has often been a consequence of poorly-timed monetary policy actions. Excessive money growth engineered by the Federal Reserve has stimulated excessive booms and inflation in the prices of goods and assets. These boom episodes were followed by market busts and recessions when the Fed attempted to course-correct by restraining money growth. Booms tend to foster misjudgments about risk that end in over-investment in certain assets. This is especially true when government encourages risk-taking via implicit “guarantees” (Fannie Mae and Freddie Mac) and “too-big-to-fail” promises, or among individuals who can least afford it, such as low-income homebuyers. Given a boom-and-bust cycle inflicted by monetary mismanagement, attempts to stimulate demand are usually the wrong prescription for a weak economy. Unemployed resources during recessions are a direct consequence of the earlier malinvestment. It is better to let asset prices and wages adjust to bring them into line with reality, while assisting those who must transition to new employment. The best prescription for instability is a neutral stance toward market risks combined with stable policy, not more badly-timed countercyclical efforts. The best prescription for economic growth is to shrink government’s absorption of resources, restoring their availability to those with incentives to use them optimally. The more that central authorities attempt to guide the economy, the worse it gets. The torpid recovery from the last recession, despite great efforts at stimulus, demonstrates the futility of demand-side stabilization policy. The sluggishness of the current expansion also bears witness to the counterproductive nature of government activism. It’s a great credit to the private market that it is so resilient in the face of long-standing government economic and regulatory mismanagement. A bureaucracy employing a large cadre of technocrats is a “luxury” that only a productive, dynamic economy can afford. Or can it? GO and GDE show the dominance of business transactions in economic activity. GDE is more than twice as large as GDP, and B2B transactions plus business investment are twice the size of consumer spending. According to Skousen, GDE varies with the business cycle much more than GDP. Many economic indicators focus on statistics at earlier stages of production, yet real final spending is often assumed to be the only measure of transactions that matters. Dividend and capital gains income are taxed at lower rates than regular wage and salary income. That such income is taxed lightly strikes progressives as offensive, but the intent and effects of these lower rates is not to redistribute income to rentiers. Rather, relatively low dividend and capital gains tax rates are in place because they limit double-taxation, minimize taxation of inflationary “gains”, and reward successful risk-taking. Dividends, and ultimately capital gains, derive from corporate earnings. Corporate income in the U.S. is taxed at the highest rate in the OECD, with a top federal rate of 38% (though the rate drops to 35% above a certain level of earnings). Dividends may or may not be paid to shareholders from corporate income, but if so, they are subsequently taxed again as personal income. If dividends were taxed as regular income to individuals, the combined federal taxes (corporate and individual) on that marginal income in upper brackets would be in excess of 75%. With state corporate and personal income taxes added on, the after-tax dividend received by an individual shareholder from each dollar of pre-tax corporate income could then be less than 10 cents in some states. The top federal tax rate on dividends is 20%, versus 39.6% for regular income. One reason that dividend income is taxed at lower rates than wage and salary income is recognition of the confiscatory nature of double taxation, as illustrated above. Realized capital gains are taxed at the same rate as dividends for the same reason. A capital gain is the increase in the value of an asset over time. Such gains are taxed only when an asset is sold, when the gain is realized. The low tax rate on gains from the sale of corporate stock also limits double taxation (and even triple taxation). Stock prices tend to rise along with the expected stream of future after-tax corporate earnings and dividends. A prospective buyer of shares knows they will incur taxes on future dividends, which limits the price they are willing to pay for the shares. So, higher future earnings will be taxed to the corporation when they occur, higher future dividends will be taxed to the buyer of shares when dividends are eventually paid, and the resulting gain in the share price received by the seller today is taxed as a capital gain to the seller. Triple (and anticipatory) taxation! A relatively low tax rate on capital gains at least helps to limit the damage from the awful incentives created by multiple taxation of the same income. Another important reason for taxing capital gains more lightly than wages and salaries is that the tax, in the presence of inflation, diminishes the real value of an asset. As an example, compare the following situations in which the price level increases by 20% over five years: Worker Joe earns $10 an hour to start with and $12 an hour at the end of year 5; Saver Dev earns $1 dividends per share of the Prophet Corp (which he plans to hold indefinitely) to start with and $1.20 at the end of year 5; Retiree Cap buys one share of Gaines Corp worth $100 at the start and sells it for $120 at the end of year 5. On a pre-tax basis, these three individuals all keep pace with inflation. The real value of their pre-tax earnings, or the share value in Cap’s case, is unchanged after five years. Cap keeps pace by virtue of a $20 capital gain, so the real value of his share is unchanged. If all three types of income are taxed at the same rate, Joe and Dev both keep pace with inflation on an after-tax basis as well. But what about Cap? After taxes, the proceeds of his stock sale are $115. Cap’s after-tax gain is only 15%, less than the inflation that occurred, so the real value of his investment was diminished by the combination of inflation and the capital gains tax. The same would be true for farmland, artwork, or any other kind of asset. It is one matter to tax flows of income that change with inflation. It is another to tax changes in property value that would otherwise keep pace with inflation. This is truly a form of wealth confiscation, and it provides a further rationale for taxing capital gains more lightly than wage and salary income, or not at all. There are further complexities that influence the results. For one thing, all three individuals would suffer real losses if inflation pushed them into higher tax brackets. This is why bracket thresholds are indexed for inflation. Another wrinkle is the “stepped-up basis at death”, by which heirs incur taxable gains only on increases in value that occur after the death of their benefactor. 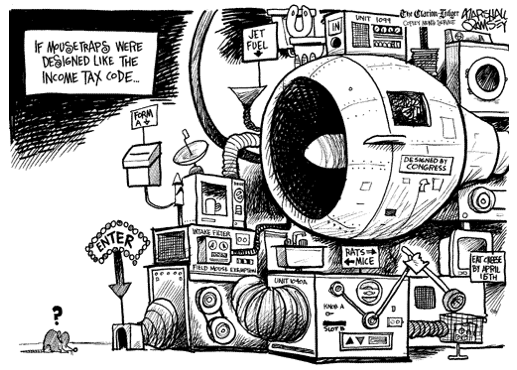 This aspect of the tax code was recently discussed on Sacred Cow Chips here. The third rationale for taxing capital gains more lightly than wage and salary income is an attempt to improve the risk-return tradeoff: larger rewards, ex ante and ex post, are typically available only with acceptance of higher risk of loss or complete failure. This is true for private actors and from a societal point of view. It is hoped that lighter taxes on contingent rewards will encourage savings and their deployment into promising ventures that may entail high risk. 1. Although the gain is realized in one year, it actually took place over more than one year. The wine did not increase in value just in the year it was sold. It took 30 years to achieve its higher price. To be fair, Dr. Henry’s point relative to the time required to achieve a gain probably has more to do with the riskiness of an asset or venture’s returns, rather than the passage of time per se. If an asset’s value increases by 4% per year, the three points raised above (multiple taxation, taxing of inflationary gains, and rewarding successful risk-taking) would be just as valid after year 1 as they are after year 5. Taxing income from capital is fraught with dangers to healthy investment incentives, which are primary drivers of employment and income growth. Double taxation of corporate income is not helpful. Capital gains taxes suffer from the same defect and others. But capital income is a ripe target for those who wish to score political points by inflaming envy. It’s a dark art.